July Employees of the Month — Congrats! Congratulations to our July Employees of the Month, Vanessa Mendoza, RN, and Angelique Engstrom! 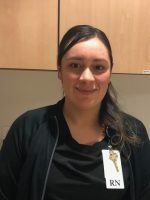 Vanessa Mendoza, RN, has been a nurse with the UNMCCC since November of 2017. Vanessa is working in Pod 2 and has done a tremendous job with coordinating care for her providers and her patients. Her co-workers have thanked her for her work ethic and her attention to detail. Vanessa is dependable and a great asset to the organization. Angelique Engstrom works in the patient services department with the New Patient Scheduling Team. Angelique embodies what is means to be a leader, a team player and a role model. Angelique knows how to stay focused and how to balance her very hefty work load! Angelique is always striving to improve her skill sets and in doing so is a great role model for all of our staff and her team. She consistently receives the praise of her co-workers for her willingness to always assist and for her knowledge that she shares. Angelique welcomes challenges with open arms. She thrives to provide excellent patient care with every patient she interacts with, this is recognized by her many patient compliments she receives. Angelique’s hard work and upbeat and positive attitude are essential for her job, especially in the business when things get extra hectic around here. No matter how crazy things get at work, Angelique is always smiling and happy to help. I could not be more thankful for her being a part of my team! !